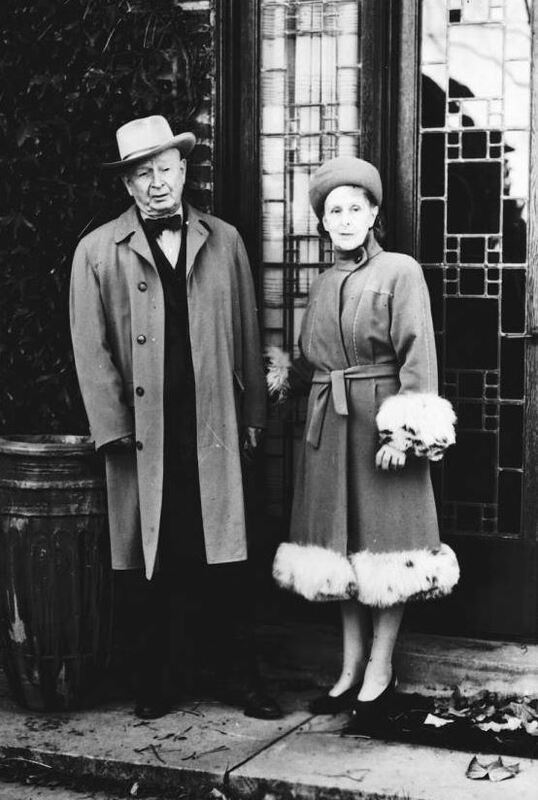 In 1931, attendees at the Beaux-Arts Ball in New York came dressed to impress. 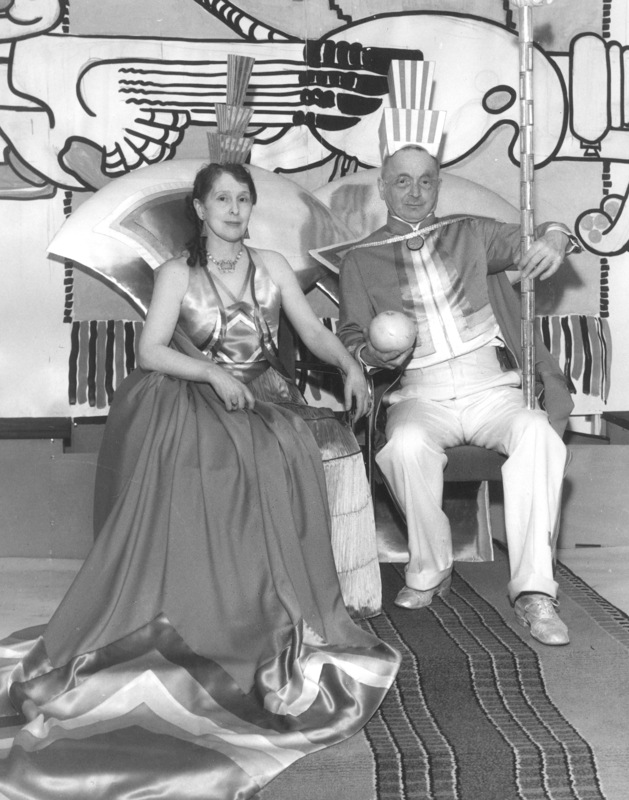 An annual party thrown by the Society of Beaux-Arts Architects, the ball featured a different theme each year. 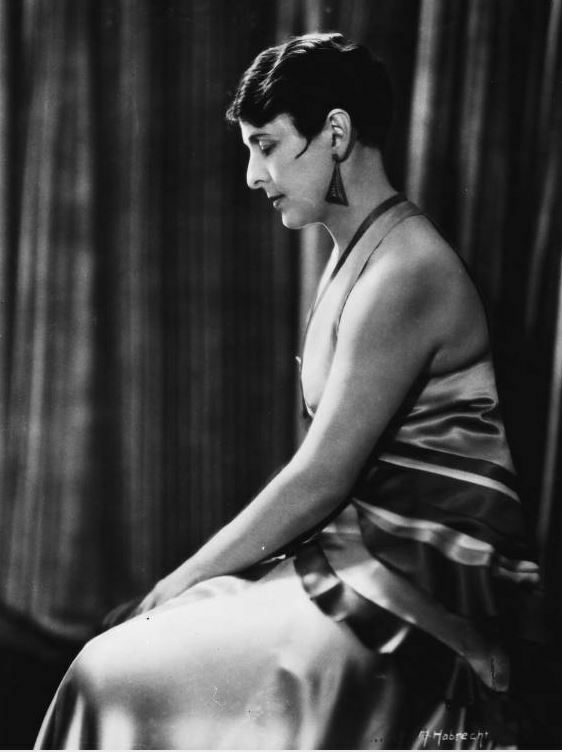 1931’s theme of “Fete Moderne — a Fantasie [sic] in Flame and Silver” was inspired by the New York skyline and the iconic skyscrapers that had recently come to define it. Fully committing to the theme, many guests came dressed as famous New York buildings. In this photo William Van Alen holds center court as the Chrysler Building (of which he was the architect) while other personified buildings crowd around him. William Van Alen as the Chrysler Building, with other masquerading architects around him. On the far right is Joseph Freelander as the Museum of the City of New York. Source: NY Times/untappedcities.com. 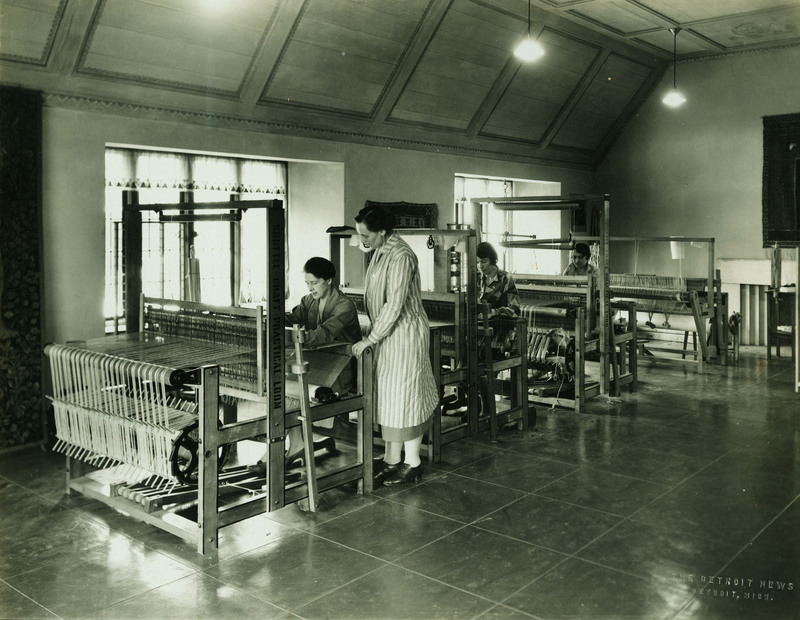 Studio Loja Saarinen weavers seated at one of the larger looms. L to R: Elizabeth Edmark, Marie Bexell, Peggy Broberg, Gerda Nyberg. 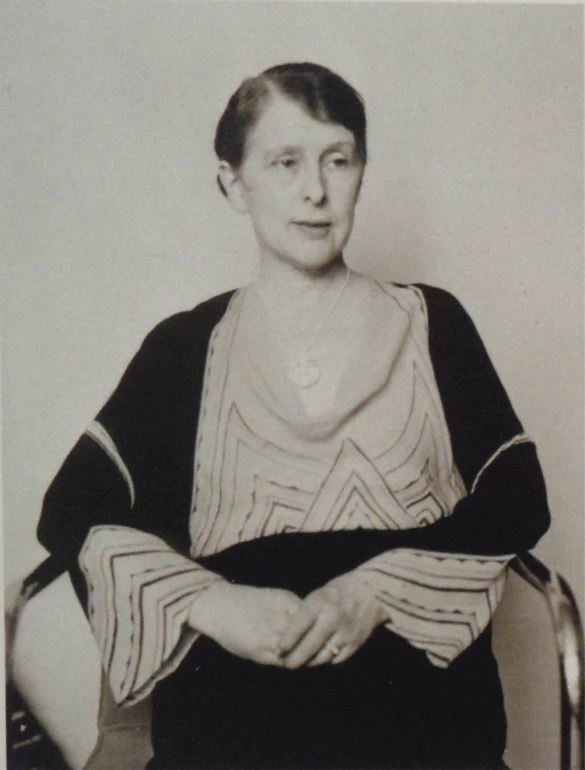 May, 1935. Cranbrook Archives. 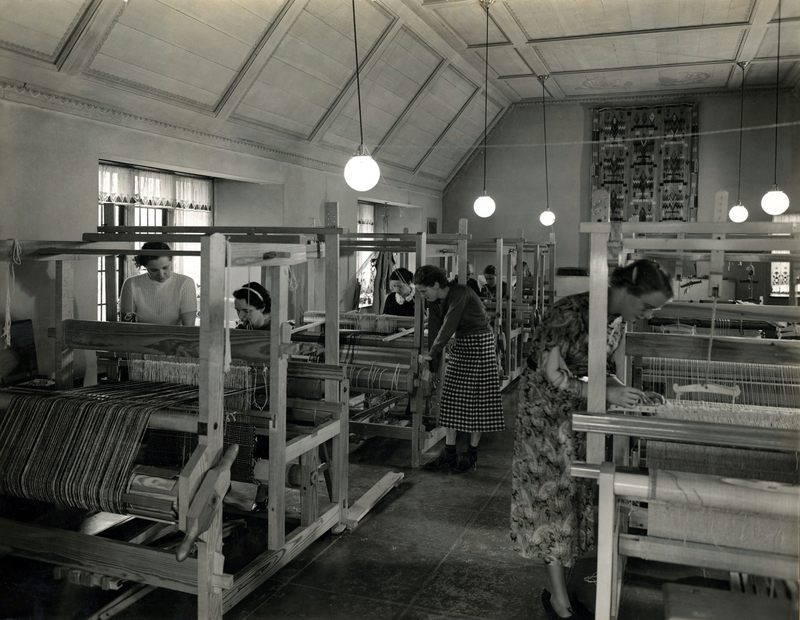 Founded in 1928, Studio Loja Saarinen served as a commercial weaving studio at Cranbrook, producing rugs, curtains, table textiles, and tapestries for both the growing Cranbrook campus and outside clients. 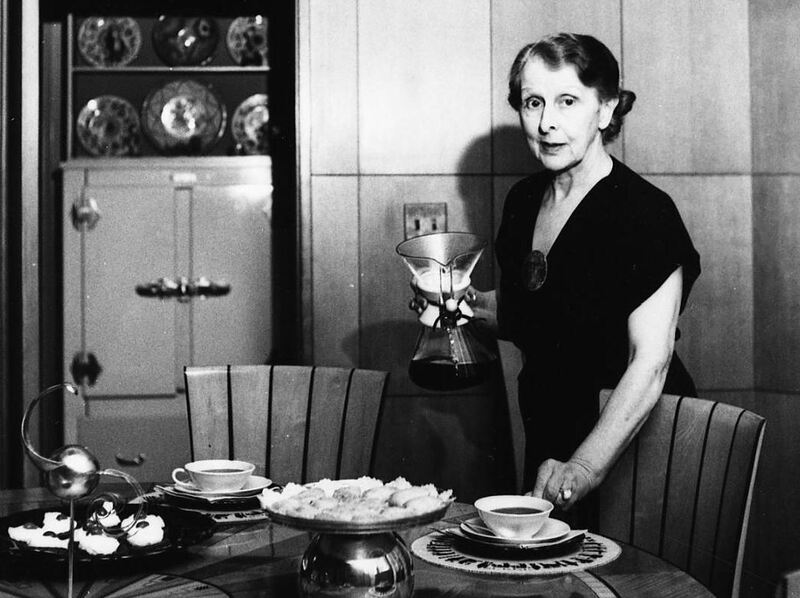 Though it bore her name, Loja Saarinen was not the sole weaver at Studio Loja Saarinen—instead, the studio employed a staff of primarily Swedish women who immigrated to the United States during the 1920s and 30s. 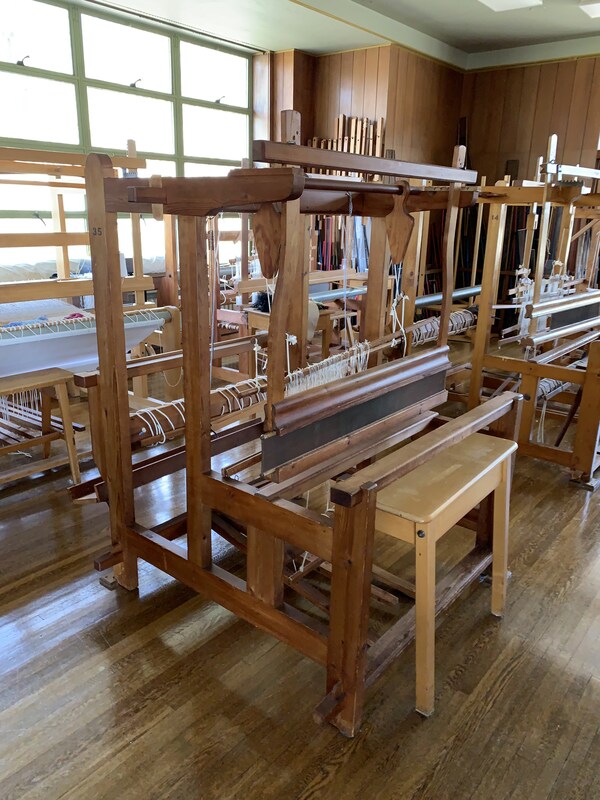 At its largest size, the studio had 30 looms in use to keep up with production demands. 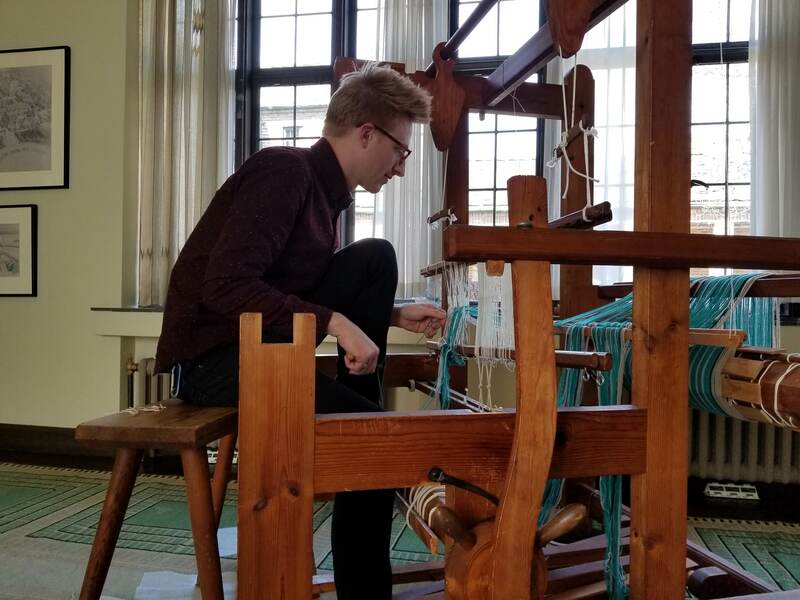 Here four of Studio Loja Saarinen’s Swedish weavers are posed at one of the large looms housed in the lower level of the studio. From left, they are: Elizabeth Edmark, Marie Bexell, Peggy Broberg, and Gerda Nyberg. Displayed before them is one of the giant rugs produced by the weavers. 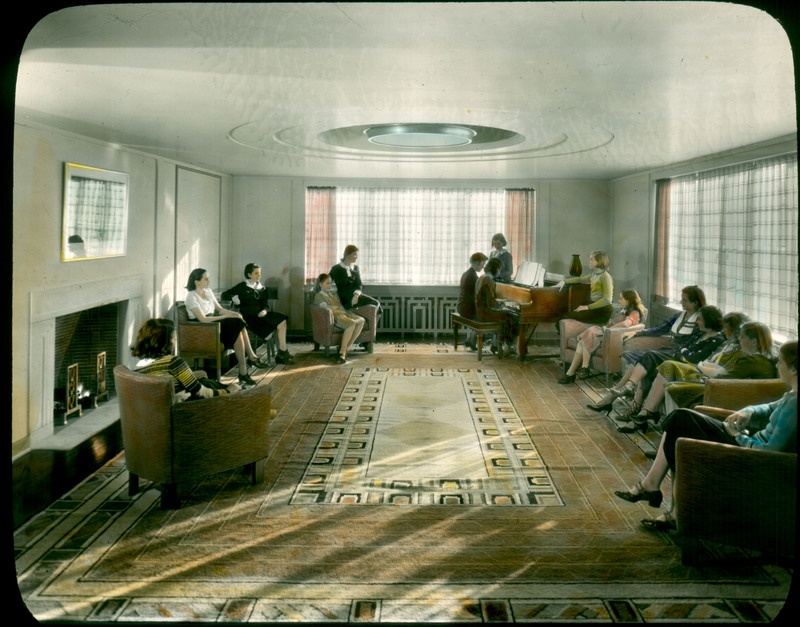 Still in use, this rug is on view in Saarinen House today. I’m recently back from a fantastic vacation to Helsinki, Finland with my daughter. We took a boat tour around the archipelago (did you know there are 315 islands surrounding the Helsinki harbor? 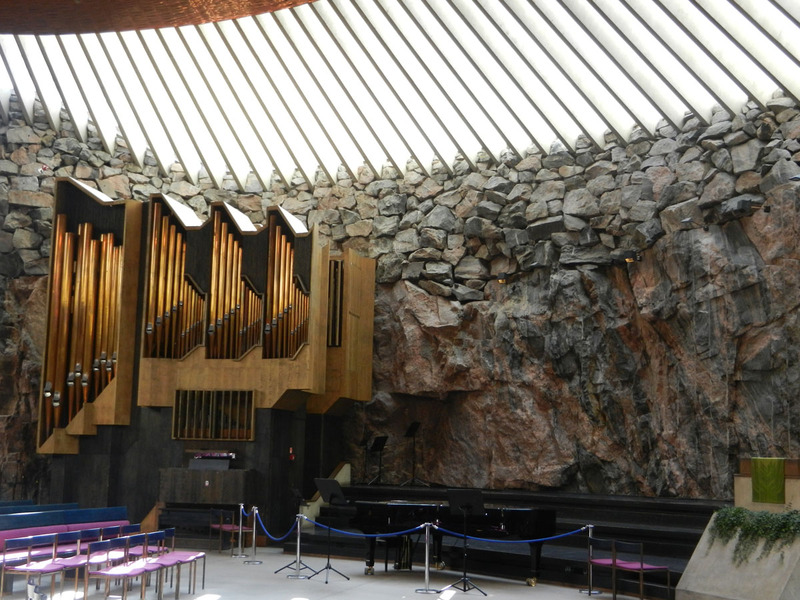 ), swam in the 1952 Olympics swimming stadium (where we had our first sauna experience), and visited the famed Temppeliaukio Church (rock church), a Lutheran church in the Töölö neighborhood of Helsinki. Designed by brothers Timo and Tuomo Suomalainen, the church, which was carved out of the granite bedrock, has a strong connection with nature – exactly what the brothers intended. When you walk through the door, the cool air of the belowground atmosphere wraps around you. The interior walls were left rough-hewn, and metal and glass were chosen carefully to complement the rock. The interior is lit by natural light streaming through 180 vertical window panes that connect the dome and the wall. Quite astounding was the copper dome ceiling – a Google search tells me that it is over 13 miles of copper strips! For me, however, one of the highlights of my trip was visiting Bobäcks skola (elementary school), not far from Hvittrask. What’s so great about visiting a school you might ask? 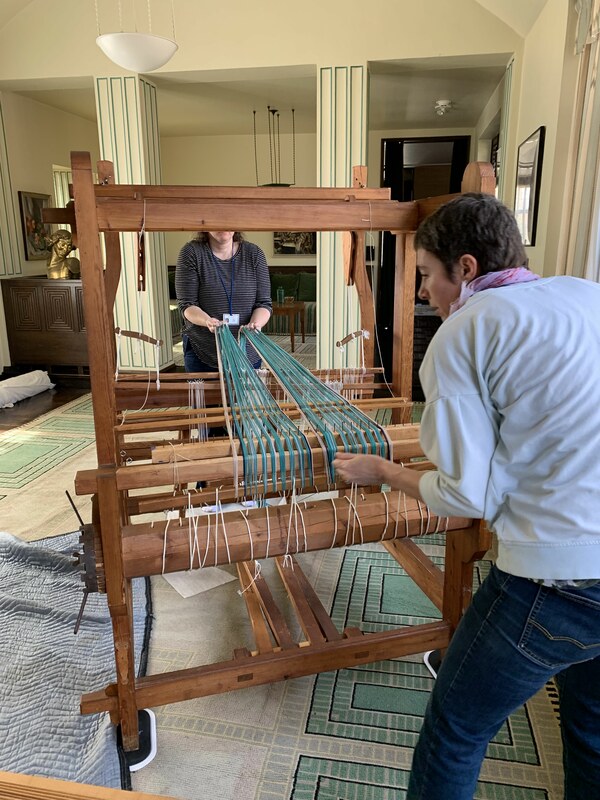 Well, it just so happens that in the 1930s, when Studio Loja Saarinen was weaving the famed May Queen Tapestry for Kingswood School for Girls, they also wove a smaller sample. 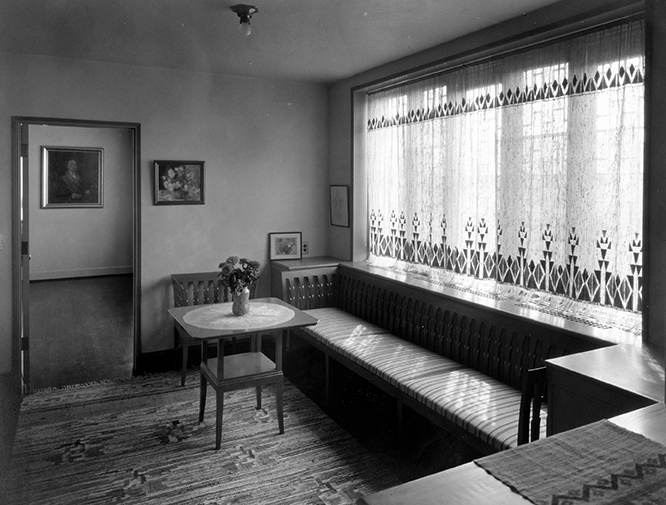 In 1952, Loja Saarienn donated this piece to Bobäcks. 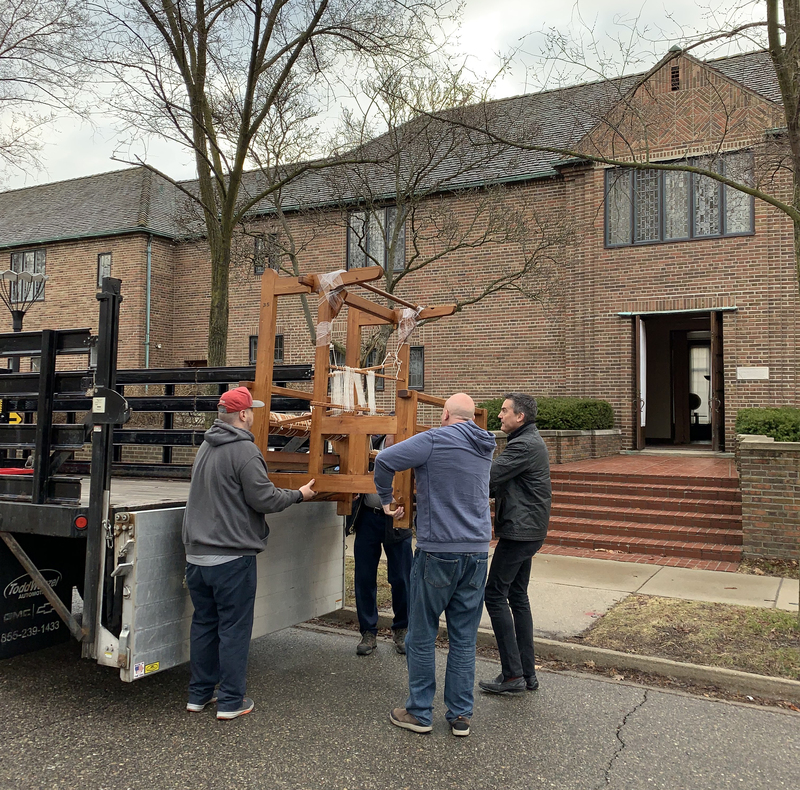 And there it hung for nearly sixty years without anyone realizing the importance of it. Fast forward to 2010, when the nearby village association determined to save the faded and worn tapestry by having it restored. 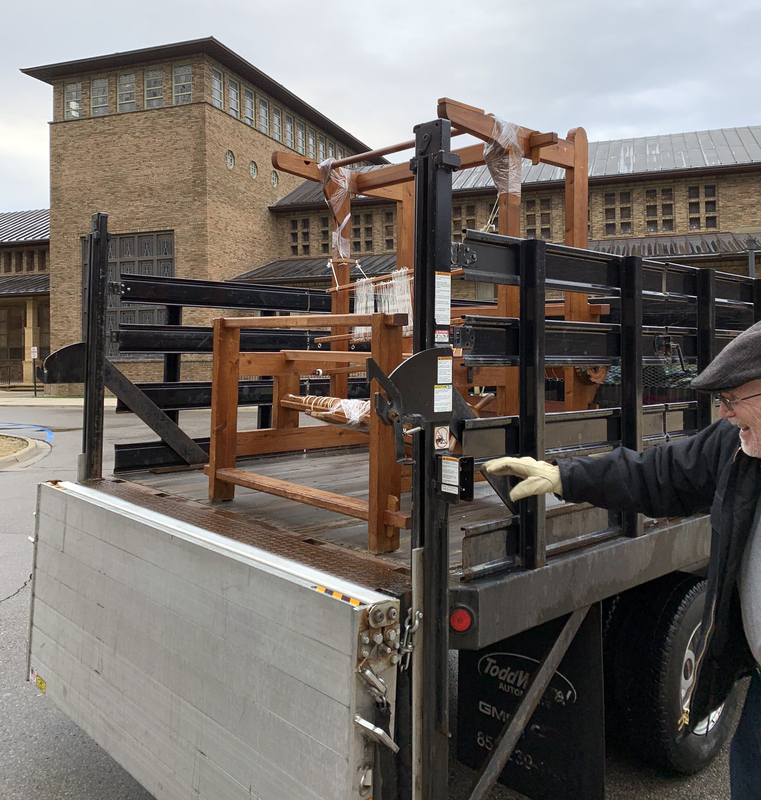 However, they also felt a responsibility to give the school a replacement in order to continue to provide students, teachers and parents alike the opportunity to experience such a fantastic tapestry. 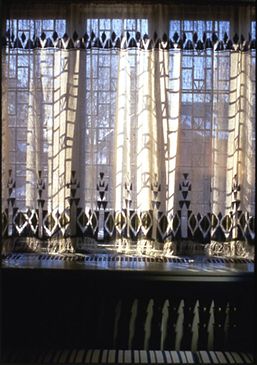 Enter artist Ann (known as Annsi) Jonasson who had been teaching woodworking classes to adults in the school for years. 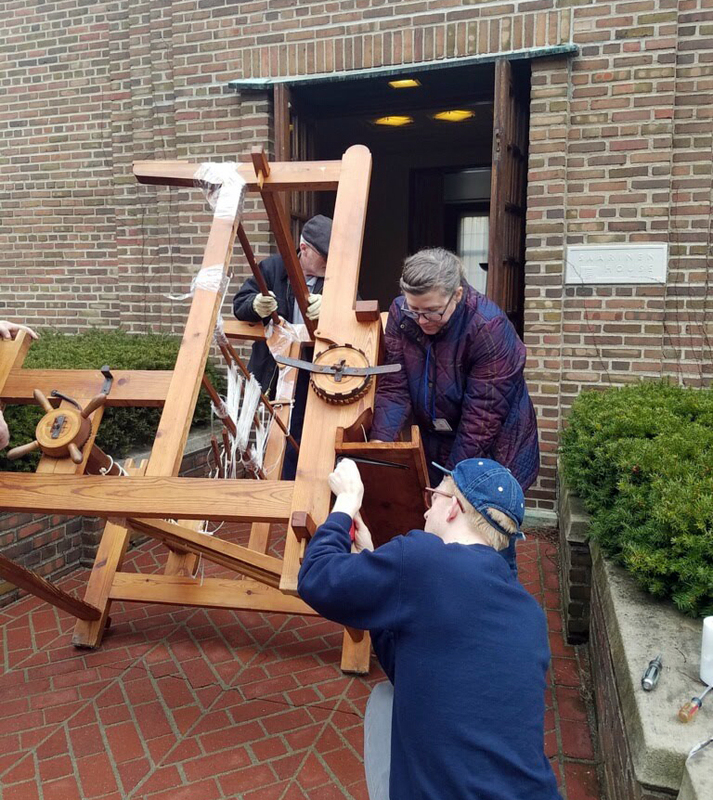 Annsi, a weaver with her own home studio in the community, was commissioned to undertake the monumental task of creating a replica of the Saarinen tapestry! 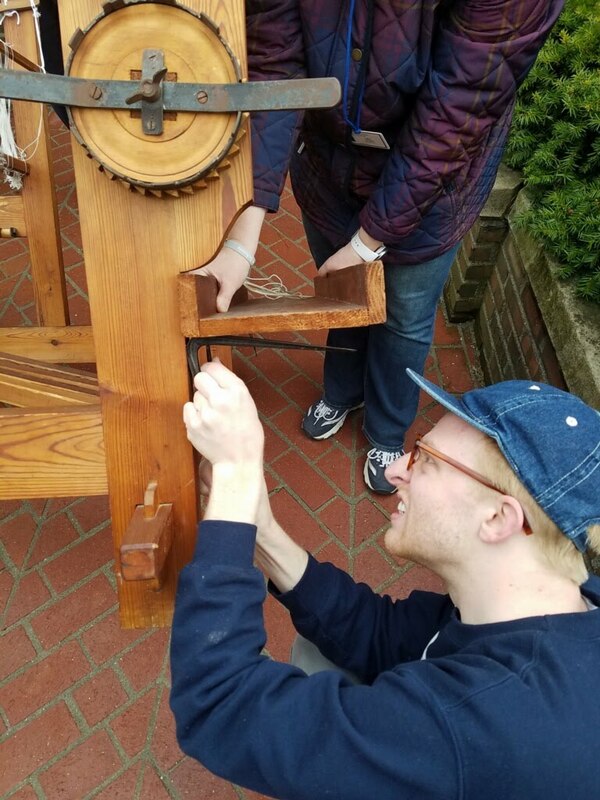 Annsi took on the responsibility and dedicated many months to studying the tapestry, meticulously counting threads and spaces in order to plot the pattern on graph paper for the copy to be as accurate as possible. 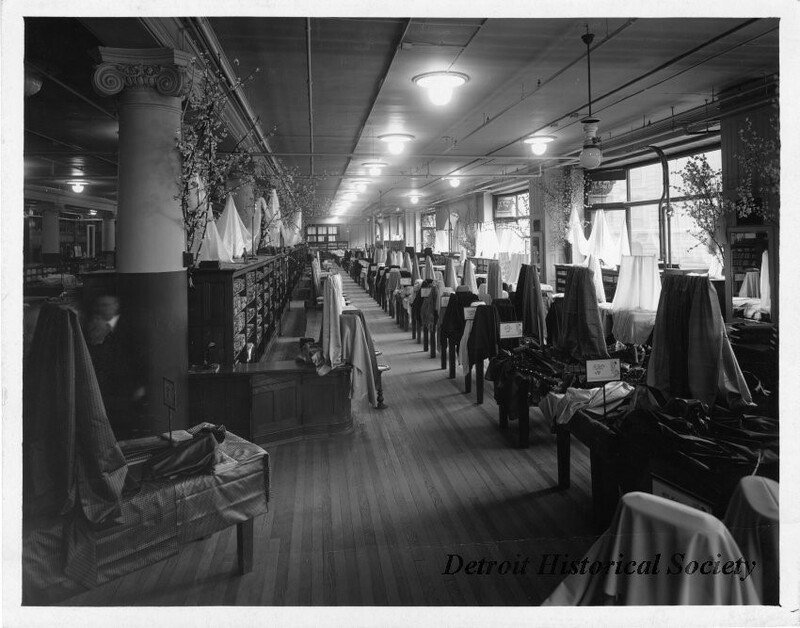 The original fabric was made of linen, wool, and silk threads in a variety of shades- nearly 170 different colors. 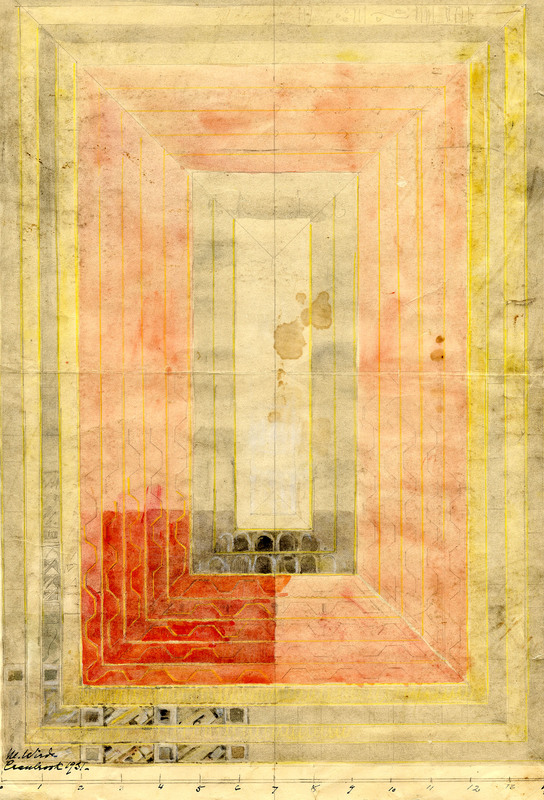 Annsi studied the colors from the backside which were less faded, and then tried to replicate the threads. 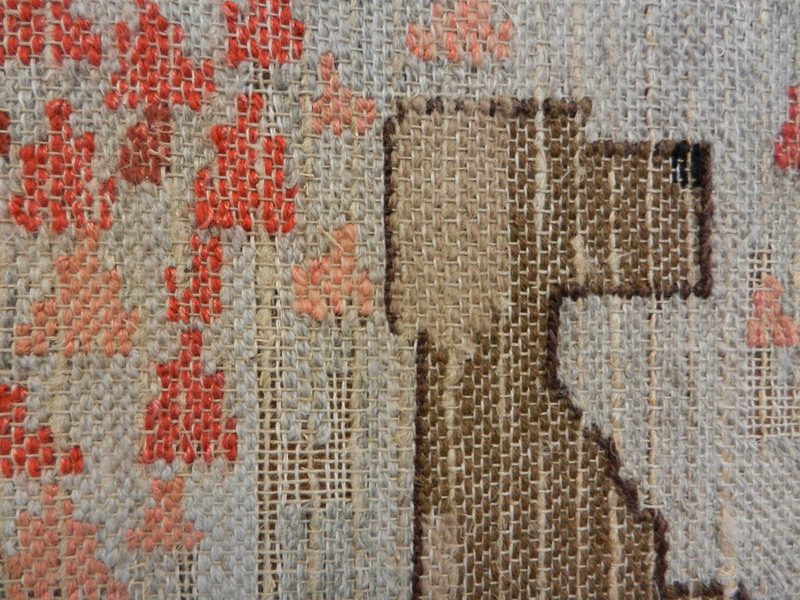 A detail of the May Queen tapestry sample showing the dog’s head. 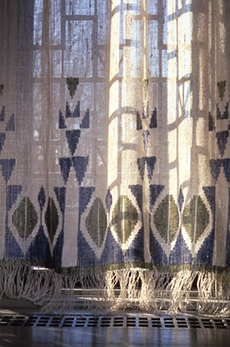 Note the spaces that were not woven, and the combinations of thread colors – sometimes a linen yarn twisted with a thread from embroidery yarn – that were used to match the original colors. Fortunately, Annsi said she has never thrown away anything useful, so she used her own personal collection to match the colors and textures. 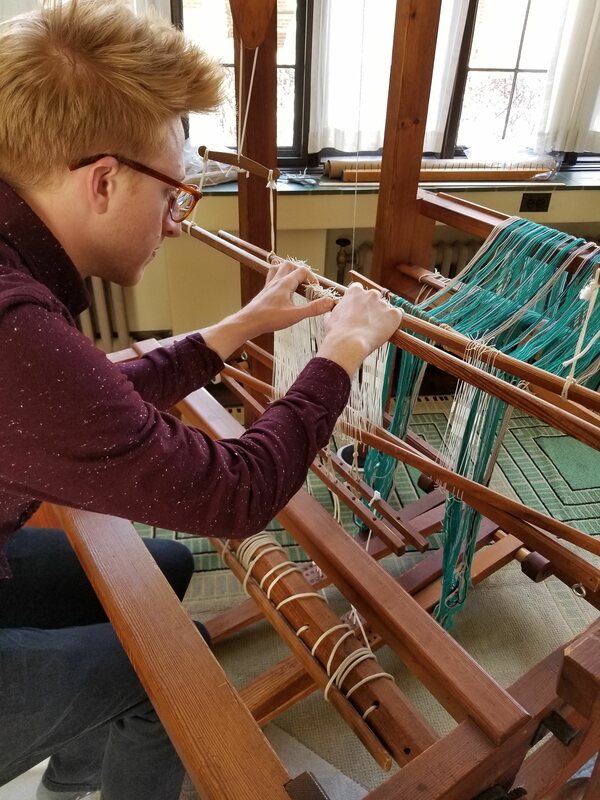 Over the years, her collection had grown thanks to the transfer of yarns and threads from friends, acquaintances, and the inheritance of yarns from her mother and grandmother. Annsi, a most kind and welcoming woman, is proud of her work and rightly so – though you probably can’t tell from the photographs here, the replica is stunning. 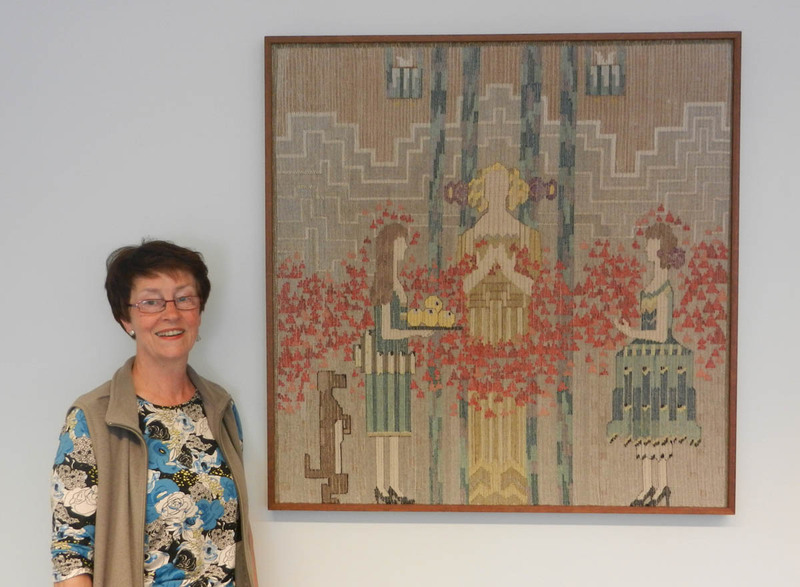 Annsi and the May Queen tapestry sample replica. 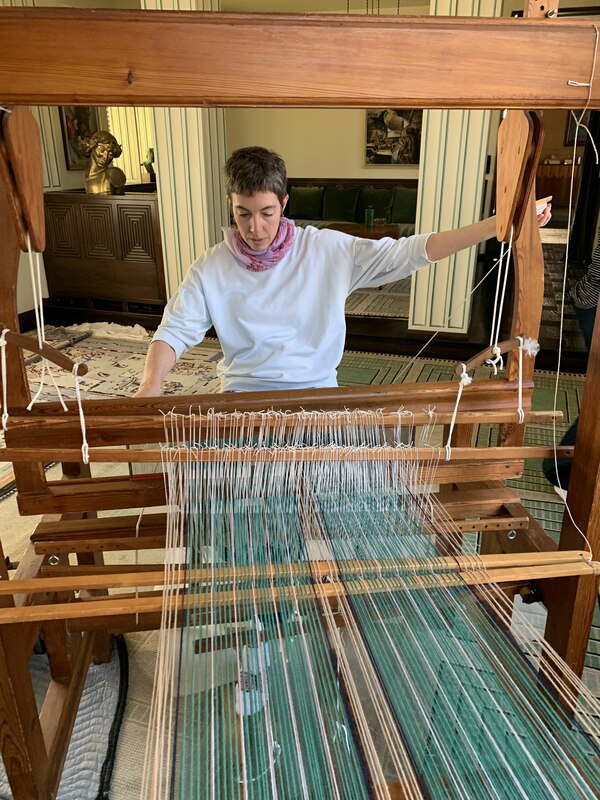 We have to give thanks that a contemporary weaver cared enough to dedicate many months of her life and literally weave part of herself into a tapestry that connects to us here at Cranbrook. 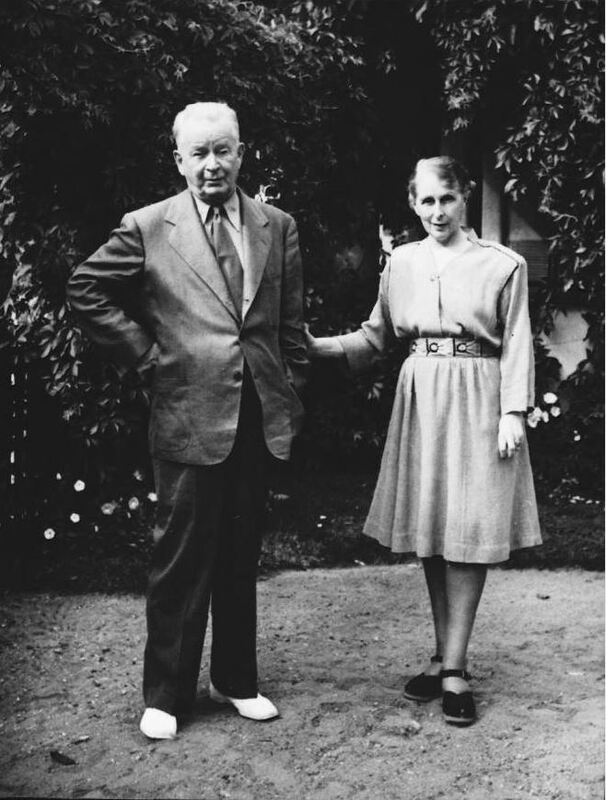 Soon she will donate to the Cranbrook Archives a copy of her research, which will help keep the Finnish-Cranbrook connection alive. 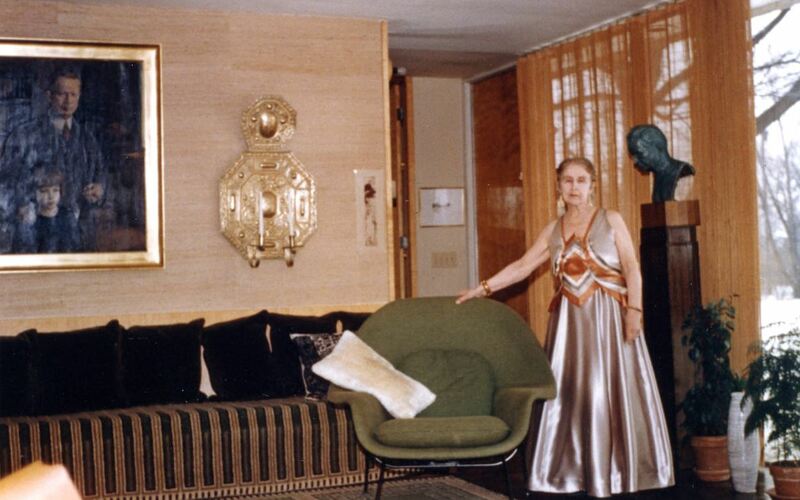 Oh, and by the way, did you know that the May Queen tapestry sample is the only known Studio Loja Saarinen work in Finland?